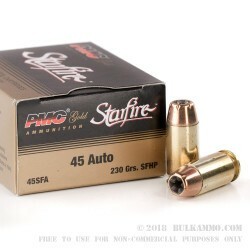 These Starfire cartridges are perfect for self-defense in your .45 ACP firearm, whether it be a 1911, Glock, or S&W M&P. 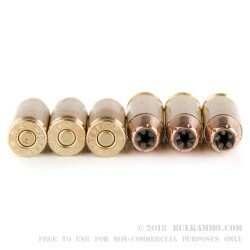 This load launches a 230 grain jacketed hollow point bullet at 850 feet per second, producing typical .45 Auto ballistics. Upon contact with the target, however, ribs embedded in the Starfire bullet rapidly fold out and extend the projectile’s penetration while creating a five-petal expansion. This takes full advantage of the high caliber of the .45 ACP round while mitigating its penetrative disadvantages. 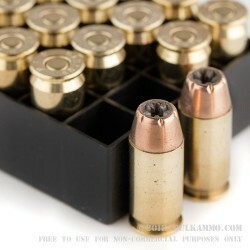 Each box of 20 rounds comes in Boxer-primed reloadable brass cases. Starfire rounds were created by renowned bullet designer Tom Burczynski. PMC, the international brand of Poongsan, a major South Korean munitions company, markets Starfire rounds as its premium personal defense cartridge. 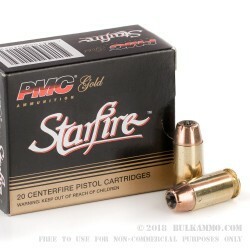 Made to even higher standards than PMC’s popular range ammo, Starfire is a proven design carried by many CCW holders nationwide. Too expensive for the quality. Stick with Hornady CD or Win Ranger Ts.